Of all the garbage dumps, which usually include January and September, the not-so-good February often has the worst week ever (quality-wise) with Super Bowl weekend. This is because no one can compete with the Super Bowl and doesn’t want to put a movie that might be good up against it and lose all the audience. However, movies have been successful on the weekend because there are still a lot of people who could care less about football. Usually, it’s a horror or thriller, as we’ve seen in the past with Boogeyman, Taken, The Roommate, The Uninvited, The Eye, The Messengers, and When A Stranger Calls. One anomaly was that Miley Cyrus/Hannah Montana concert film that made $42 million on Super Bowl weekend a few years ago. Last year, two movies defied expectations on Super Bowl weekend: Chronicle and The Woman in Black, which both made $20 million in the opening frame. Warm Bodies comes courtesy of Jonathan Levine, who brought us the under-watched 50/50 a couple of years ago. It also comes courtesy of Summit Entertainment, the studio behind Twilight. Here, they’re sort of poking fun at the whole human/psuedo-human romance, although it’s done with heart and respect, and it’s done smartly. A young, wandering zombie, who only remembers the first letter of his name from when he was living, “R,” (Nicholas Hoult, of About A Boy and X-Men: First Class) has an inner monologue that is distinctly today’s teenager, or at least movie teenager. He has only one “friend,” who is called “M” (Rob Corddry). Even the zombies have some antagonists, called “Bonies,” those who have stripped their flesh away and are just flesh-eating nightmares, although they don’t bother the fleshy zombies all that much. In living civilization, surrounded by walls, the people are wired to kill zombies, and occasionally they have to go out and find supplies. A team which includes our female protagonist Julie (Teresa Palmer) and her boyfriend Perry (Dave Franco) and her best friend Nora (Crazy, Stupid, Love’s Analeigh Tipton) are sent out by Julie’s dad (John Malkovich) and end up running into hungry zombies…an encounter that starts changing R for the better, as he falls in love with Julie and starts feeling things he hasn’t since the days he was living. R, at first, saves Julie from being eaten and then essentially kidnaps her. 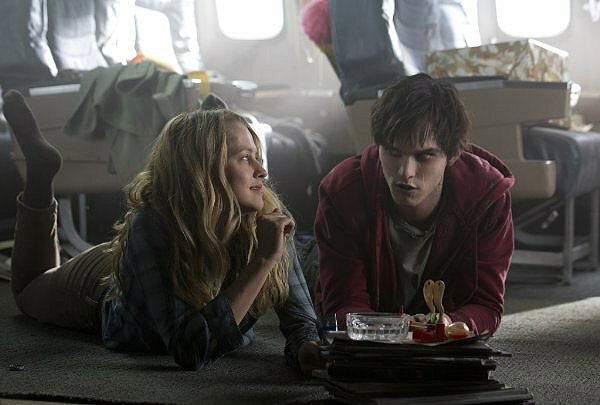 Warm Bodies is a fun picture, with a great soundtrack. Movies like this often have all-too-familiar tunes so they can capitalize on already-popular songs to sell albums. But this one has really good music that maybe you’ve heard before, but not on the radio a billion times already. But this is a breezy flick, pretty funny, ridiculous in the right ways, and moves at a brisk 90 minutes. You know who almost steals this whole picture in the few scenes he’s in? Rob Corddry, who plays a zombie with just the right amount of gravitas. I didn’t think I’d ever say that about a zombie character, but Corddry plays it just right. This is a fun movie if you’re passing time to the Super Bowl. And if you miss it this weekend, go see it during the Valentine’s Day onslaught.